For all of June and July, Starbucks became my second home. I was actually at Starbucks so much that I would watch the morning baristas clock out and the afternoon ones clock in. They were very tolerant of me taking up their tables for hours at a time, so I’ve decided that my first recipe back will be my favorite Starbucks dessert. If you go to Starbucks they have these salted caramel squares that are absolutely delicious. On the days I needed to treat myself, this was my go to. However, since this is Starbucks, these aren’t the cheapest two bite treats on the market. So I decided to try to make them myself, and I was successful. Keep reading for the recipe…. (1) Preheat oven to 375 degrees. Spray an 8×8 pan with cooking spray. (2) Beat the brown sugar, butter, vanilla and salt with a mixer at medium speed until well-blended. Lightly spoon flour into measuring cup and level with a knife. Add the flour to the sugar mixture and mix until well-blended. Start working on the caramel while the crust is baking. (4) Combine the milk and caramels in a medium saucepan. Place over low heat and cook until the candies are completely melted, stirring occasionally. Stir in 1 teaspoon of vanilla and remove from heat. In a separate bowl, mix the pecan and crushed pretzels together. (5) Remove the crust from the oven. Pour the caramel mixture (but reserve some for the topping) evenly over the hot crust. Sprinkle with the pretzel/pecan mixture. 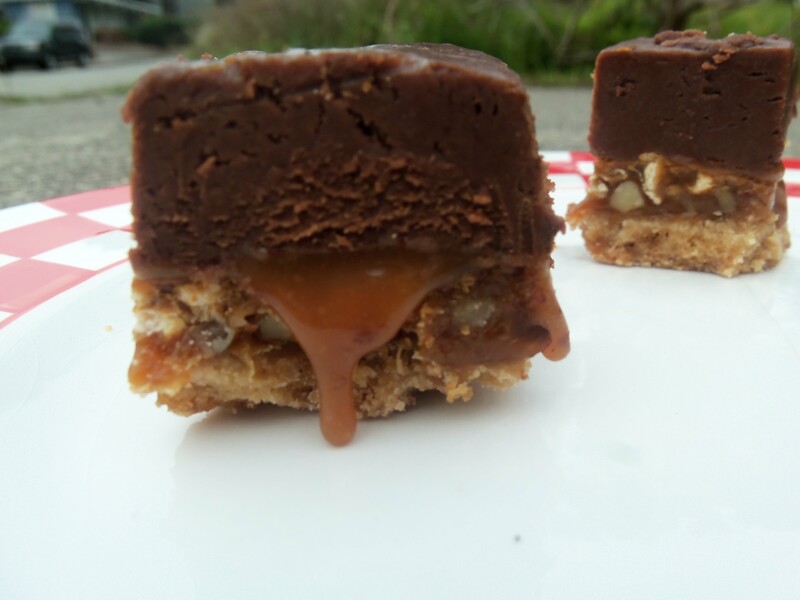 (I mixed it in with the caramel a little and put a little more of a layer over the caramel. The original recipe said 2 cups of pretzels and a 1½ cups of pecans. That is wayyy too much. I have to believe that is a typo). Bake for 10-15 minutes. Let cool completely. (6) Combine the sugar, evaporated milk and butter in a saucepan. Bring to a boil over medium heat and stir constantly. Let it boil for about 5 minutes. Remove from heat and then stir in the marshmallows and chocolate chips until melted and combined. Add vanilla and stir. (7) Pour fudge mixture in top of cooled crust mixture. (I didn’t end up using all of the fudge. I felt like it also made too much fudge. I would say I used about ¾ [maybe a little more] of the fudge. It will still make a thick amount of fudge on the square.) Warm the reserved caramel in the microwave. 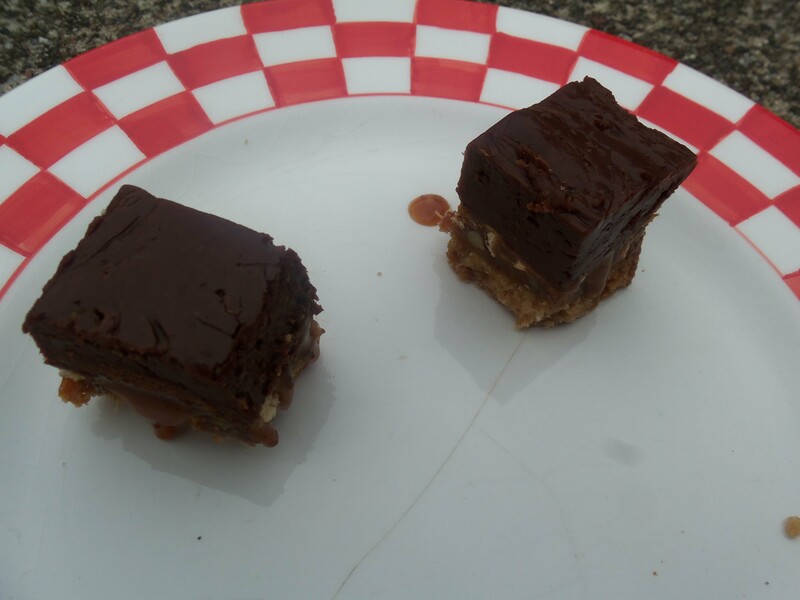 Add a pinch of salt to the caramel and drizzle over the fudge layer. Take a knife and gently run it through the salted caramel to make a marbled like design. (8) Chill, set and cut into squares. Thank you Starbucks for the past two months, hope to never study in you again! the flour was omitted from the crust and the milk was omitted from the caramel- what are the amounts? Thanks for bringing that to my attention amy! I’ve changed the recipe above to correct the problems. It’s 3/4 cup of flour in the crust and 4 tablespoons of regular milk. Sorry about that! I hope they come out delicious for you!! This looks delicious! 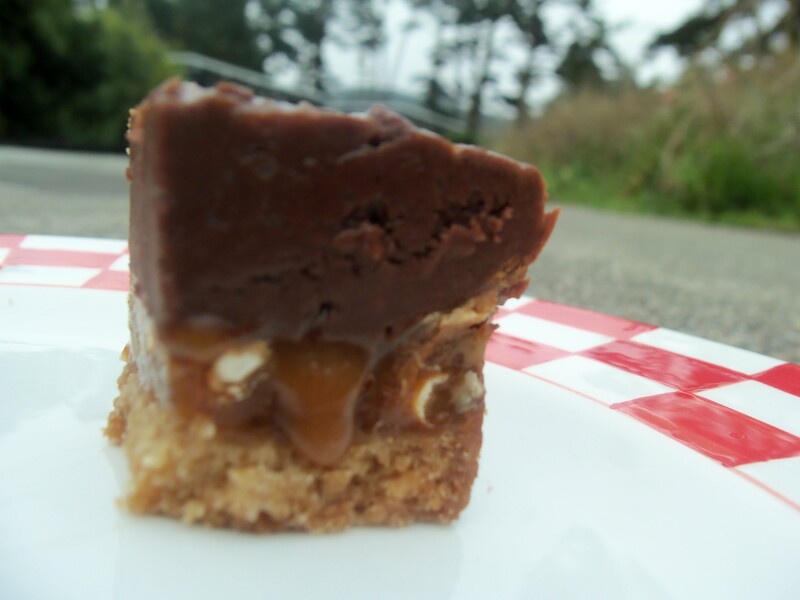 I’m in a chocolate and caramel mood lately so I will definitely have to try this recipe. I saw your link on sweet as sugar cookies. I post my red currant lemon pot de creme if you’d like to check it out. I’m obsessed with your Strawberry Lemon Cupcakes. I’ll have to make those for myself one day! Ahhhhh…..you got me! That caramel layer coming out looks amazing! Great photos! Hope the recipe works as well for you! what is 80 piece of fudge, weight please !!! and also please could you adapt the cups into ounces !! thank you very much. I tasted these delicious cookies in Starbucks. I’m so glad my blog has reached Scotland!! The conversion of cups to ounces depends on whether Scotland uses US measurements or British measurements. I’m going to guess you use British measurements, but I’ll try to provide both. As far as the 80 pieces of caramel, I got this bag from our local grocery store Safeway. I used three of these bags. The bag says it is 8 US ounces or 226 grams. So total 24 US ounces and 678 grams. I’m not quite sure how to convert this one. But each caramel piece is about 10 US grams. Thanks for this recipe, I plan on trying it tonight! I will let you know how it goes!! Great! I love when people let me know how it turned out. Good Luck! Also, I’ll be posting a pecan pie and sweet potato cupcake recipe in the next couple days. Check back! I made these last night! They are very sweet and rich but super tasty! They are definitely different from the Starbucks ones, but still really good. Thanks! Did you end up making it? I’m going to start posting new recipes again this Sunday so make sure to check back! wondering about a homemade caramel layer, really don’t feel like unwrapping ALL those caramels! Do you have a good one? Also I am gonna try them in a larger pan, so the squares are thinner. I’ve actually never made a caramel sauce on my own. However, here is a recipe from a blogger that I know makes wonderful items. She has a recipe for Homemade Salted Caramel Sauce that I think would be wonderful with these. Let me know how it turns out, as I should try making this too!